My kids get excited whenever they get a new book. 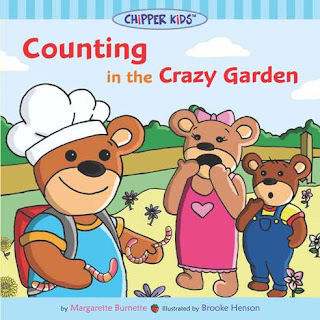 But 5 year old Zachary was especially excited to see Counting in the Crazy Garden by Margarette Burnette. Maybe because there were cute bears on the cover. The story, about Arnold Chipper, starts out with him “cooking” with food from his garden. Only his garden consisted of yummy things like worms, tumbleweed, mud and dandelions. Yes, it sounds a lot like my garden. As Arnold makes new foods, like “peely, prickly, stick and stone scones” and “plates of pine needle noodles” he tries serving them to his brother Albert and friend Maria. They aren’t impressed at all. Each new culinary delight is a tongue twister combined with a number, so the kids get to practice counting the items on the page, and if you’re in kindergarten, can try to recognize the number spelled out letters. Here’s the SPOILER (don’t read on if you like a mystery). At the end, Albert and Maria help Arnold plant ten seeds which grow into a delicious garden of strawberries and tomatoes (granted those sound as delicious to Zachary as the mud pies). So the kids also learn about plants growing, in addition to numbers. The book is written by Margarette Burnette, illustrated by Brooke Henson. It’s a cute book, appropriate for kids ages 3-7.